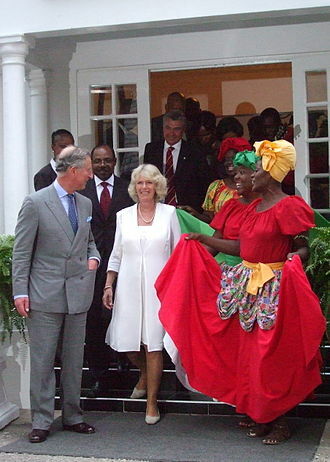 By far the strongest cultural and tourism aspect of Yukon is the legacy of the Klondike Gold Rush (1897–1899), which inspired such contemporary writers at the time as Jack London, Robert W. Service, and Jules Verne, and which continues to inspire films and games, such as Mae West's Klondike Annie and The Yukon Trail (see Cultural legacy of the Klondike Gold Rush). 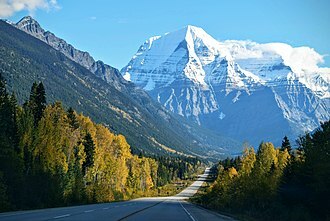 Today, major land routes include the Alaska Highway, the Klondike Highway (between Skagway and Dawson City), the Haines Highway (between Haines, Alaska, and Haines Junction), and the Dempster Highway (linking Inuvik, Northwest Territories to the Klondike Highway, and the only road access route to the Arctic Ocean, in Canada), all paved except for the Dempster. Other highways with less traffic include the "Robert Campbell Highway" linking Carmacks (on the Klondike Highway) to Watson Lake (Alaska Highway) via Faro and Ross River, and the "Silver Trail" linking the old silver mining communities of Mayo, Elsa and Keno City to the Klondike Highway at the Stewart River bridge. 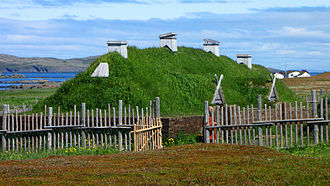 Air travel is the only way to reach the far north community of Old Crow. 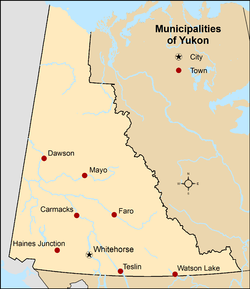 Whitehorse is the capital and only city of Yukon and the largest city in northern Canada. It was incorporated in 1950 and is located at kilometre 1426 on the Alaska Highway in southern Yukon, Whitehorses downtown and Riverdale areas occupy both shores of the Yukon River, which originates in British Columbia and meets the Bering Sea in Alaska. 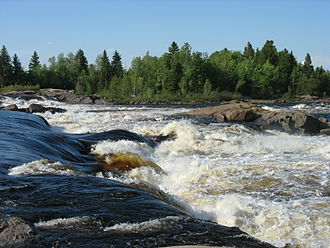 The city was named after the White Horse Rapids for their resemblance to the mane of a horse, near Miles Canyon. 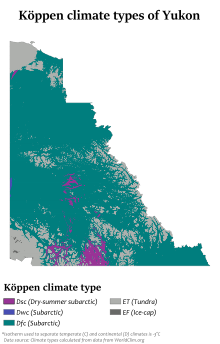 Because of the location in the Whitehorse valley, the climate is milder than comparable northern communities such as Yellowknife. At this latitude winter days are short and summer days have up to about 19 hours of daylight, Whitehorse, as reported by Guinness World Records, is the city with the least air pollution in the world. 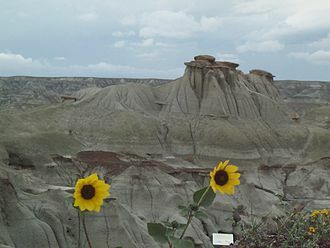 Archeological research south of the area, at a location known as Canyon City, has revealed evidence of use by First Nations for several thousand years. 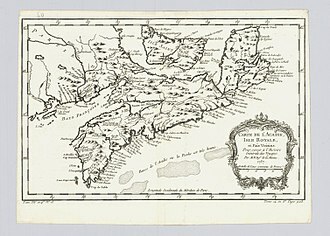 The surrounding area had seasonal camps and Frederick Schwatka, in 1883. Before the Gold Rush, several different tribes passed through the area seasonally, the discovery of gold in the Klondike in August,1896, by Skookum Jim, Tagish Charlie and George Washington Carmack set off a major change in the historical patterns of the region. Early prospectors used the Chilkoot Pass, but by July 1897, by June 1898, there was a bottleneck of stampeders at Canyon City, many boats had been lost to the rapids as well as five people. 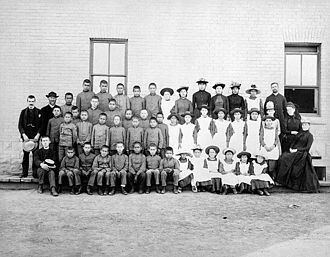 Samuel Steele of the North-West Mounted Police said, why more casualties have not occurred is a mystery to me, on their way to find gold, stampeders found copper in the copper belt in the hills west of Whitehorse. The first copper claims were staked by Jack McIntyre on July 6,1898, a small settlement was developing at Canyon City but the completion of the railway to Whitehorse in 1900 put a halt to it. The White Pass and Yukon Route narrow-gauge railway linking Skagway to Whitehorse had begun construction in May 1898, construction began again at the north end of Bennett lake to Whitehorse. The common raven, known as the northern raven, is a large all-black passerine bird. Found across the Northern Hemisphere, it is the most widely distributed of all corvids, there are at least eight subspecies with little variation in appearance, although recent research has demonstrated significant genetic differences among populations from various regions. Common ravens can live up to 21 years in the wild, young birds may travel in flocks but mate for life, with each mated pair defending a territory. 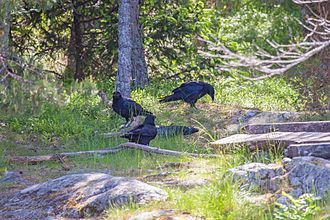 Common ravens have coexisted with humans for thousands of years and in some areas have been so numerous that people have regarded them as pests, some notable feats of problem-solving provide evidence that the common raven is unusually intelligent. Over the centuries, it has been the subject of mythology, art, the common raven was one of the many species originally described by Linnaeus in his 18th century work, Systema Naturae, and it still bears its original name of Corvus corax. 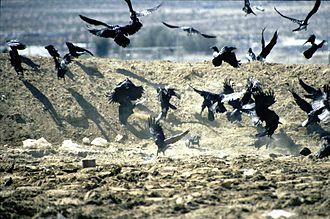 It is the species of the genus Corvus, derived from the Latin word for raven. The specific epithet, corax/κοραξ, is the Ancient Greek word for raven or crow, the modern English word raven has cognates in all other Germanic languages, including Old Norse hrafn and Old High German raban, all which descend from Proto-Germanic *khrabanas. An old Scottish word corby or corbie, akin to the French corbeau, has used for both this bird and the carrion crow. Obsolete collective nouns for a group of ravens include unkindness and conspiracy, in practice, most people use the more generic flock. 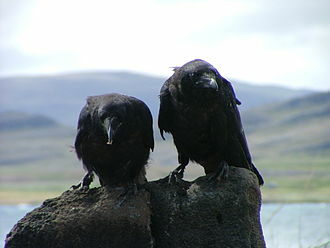 The closest relatives of the raven are the brown-necked raven, the pied crow of Africa. While some authorities recognized as many as 11 subspecies, others only recognize eight, The common raven evolved in the Old World, birds from both clades look alike, but the groups are genetically distinct and began to diverge about two million years ago. Ravens in the Holarctic clade are more related to the pied crow than they are to the California clade. 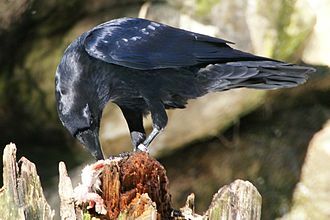 Thus, the common raven species as traditionally delimited is considered to be paraphyletic, one explanation for these genetic findings is that common ravens settled in California at least two million years ago and became separated from their relatives in Europe and Asia during an ice age. It is known by the synonyms Chamerion angustifolium and Epilobium angustifolium. It is native throughout the temperate Northern Hemisphere, including parts of the boreal forests. 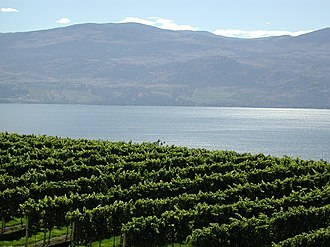 Under this taxonomic arrangement and Epilobium are monophyletic sister genera, two subspecies are recognized as valid, Chamaenerion angustifolium subsp. Circumvagum Hoch The specific epithet angustifolium is constructed from the Latin words angustus meaning narrow and it shares this name with other species of plant including Vaccinium angustifolium. 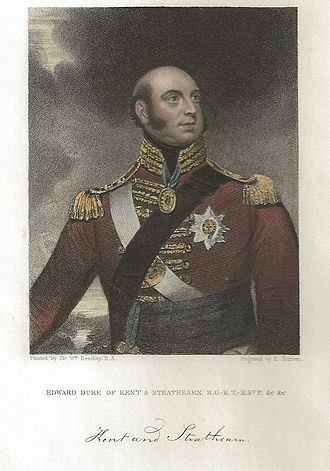 The common British name, from the resemblance of the flowers to roses. The common name fireweed derives from the species abundance as a coloniser on burnt sites after forest fires, the reddish stems of this herbaceous perennial are usually simple, smooth,0. 5–2.5 m high with scattered alternate leaves. The inflorescence is a terminal raceme that blooms progressively from bottom to top. The flowers are 2 to 3 cm in diameter, slightly asymmetrical, with four magenta to pink petals, the protruding style has four stigmas. The floral formula is ✶/↓ K4 C4 A4+4 or 4+0 Ğ, the upright, reddish-brown linear seed capsule splits from the apex and curls open. It bears many minute seeds, about 300 to 400 per capsule and 80,000 per plant. The seeds have hairs to aid wind dispersal and are very easily spread by the wind, often becoming a weed. Once established, the plants spread extensively by underground roots, Fireweed is often abundant in wet calcareous to slightly acidic soils in open fields and particularly burned-over lands. It is a species that quickly colonizes open areas with little competition, such as the sites of forest fires. Plants grow and flower as long as there is open space, as trees and brush grow larger the plants die out, but the seeds remain viable in the soil seed bank for many years. When a new fire or other disturbance occurs that opens up the ground to light again, the seeds germinate. Some areas with heavy seed counts in the soil can, after burning, be covered with dense stands of this species. In Britain the plant was considered a species in the 18th century. 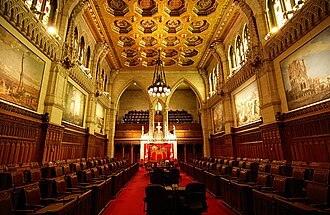 The Senate of Canada is a component of the Parliament of Canada, along with the House of Commons and the Monarch. 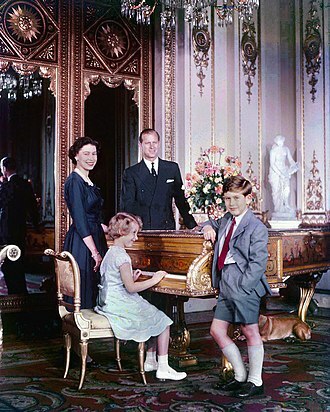 The Senate is modelled after the British House of Lords and consists of 105 members appointed by the Governor General on the advice of the Prime Minister, Senators may serve until they reach the age of 75. The Senate is the house of Parliament and the House of Commons is the lower house. As a matter of practice and custom, the Commons is the dominant chamber, the approval of both chambers is necessary for legislation and, the Senate can reject bills passed by the Commons. Between 1867 and 1987, the Senate rejected fewer than two bills per year, but this has increased in recent years. 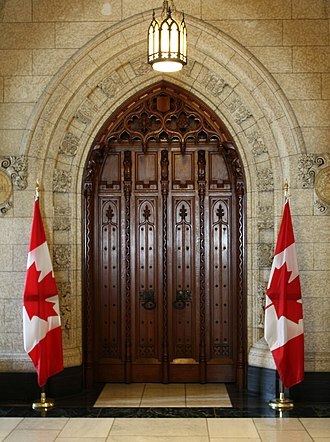 Moreover, members of the Cabinet are responsible solely to the House of Commons, while the prime minister and the rest of Cabinet remain in office only while they retain the confidence of the Commons, Senators are not beholden to such control. The Senate of Canada and the House of Commons of Canada sit in separate chambers in the Centre Block on Parliament Hill, located in Ottawa, Ontario. The chamber in which the Senate sits is called the red chamber, due to the red cloth that adorns the chamber. The red Senate chamber is decorated, in contrast with the more modest. There are chairs and desks on both sides of the chamber, divided by a centre aisle, the Speakers chair is at one end of the chamber, in front of it is the Clerks table. 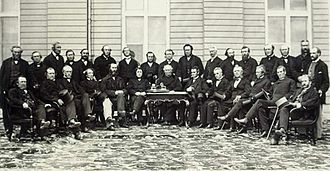 Various clerks sit at the table, ready to advise the Speaker, Members of the governing party sit on the benches to the Speakers right, while members of the Opposition occupy the benches on the Speakers left. The seat has the coat of arms of the Princess Louise The first two seats are vacant but present during the sitting of the Senate. 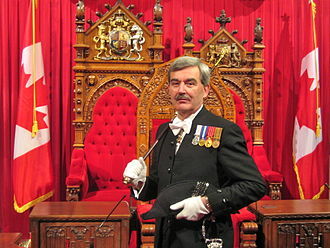 The Speaker of the Senate uses the third seat with the Arms of Canada and this seat is removed during the throne speech. At either end of the chamber, on the floor, are the visitors galleries. 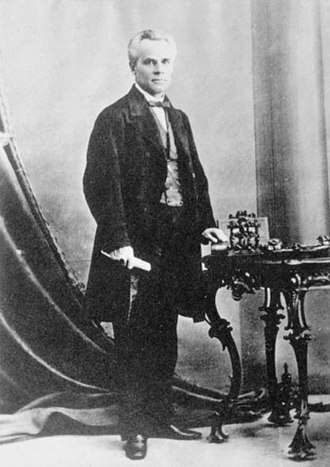 The north gallerys lower seating area, or tribune, is reserved for journalists, the Governor General holds the power to make normal senatorial appointments, although, in modern practice, they make appointments only on the advice of the prime minister. 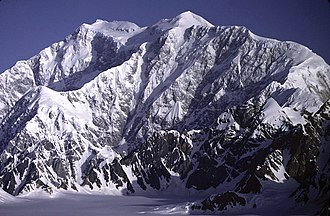 Kluane National Park and Reserve are two units of Canadas national park system, located in the extreme southwestern corner of the territory of Yukon. Kluane National Park Reserve was established in 1972, covering 22,013 square kilometers, the park includes the highest mountain in Canada, Mount Logan of the Saint Elias Mountains. 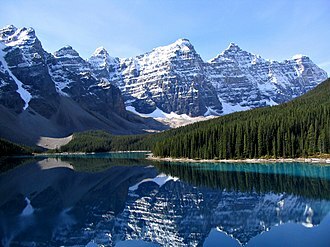 Mountains and glaciers dominate the landscape, covering 83% of its area. 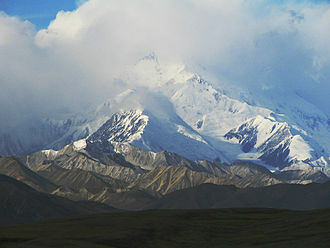 The rest of the land in the park is forest and tundra—east of the largest mountains, trees grow only at the parks lowest elevations. The primary tree species are spruce, balsam poplar and trembling aspen. The park contains about 120 species of birds, including the rock ptarmigan, a day-use area with boat launch, picnic facilities and campground is located at Kathleen Lake, and is operated from mid-May to mid-September. Hiking is an activity on trails such as St. The park was the subject of a film in 2011s National Parks Project, directed by Louise Archambault and scored by Graham Van Pelt, Ian DSa. New kaleidoscope pattern mailbox with the Canada Post brand. 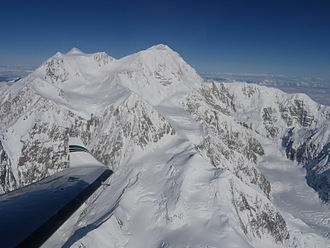 An aerial shot of Kluane National Park's glaciers, icefields, and small mountains.